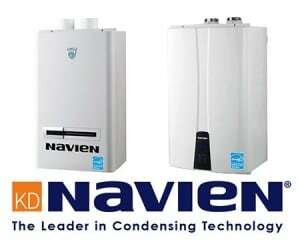 What is a tankless water heater, you’re likely asking? For starters it’s one of the most increasingly-popular types of hot water heaters in Toronto homes. In addition to their space-saving designs and endless supply of hot water, they’re also among today’s most durable and energy-efficient water heating systems. People rave over their tankless water heaters for many reasons, though endless hot water is clearly a universal favorite. Forget the days of waiting for the water to heat up, and never run out of hot water in the shower again. You’ll have the luxury of as much hot water as you need, and exactly when you need it. Looking for a way to maximize space without compromising on hot water heating performance? SunnySide offers a complete line of tankless units that take up very little space. This includes several models from Navien that can be wall mounted, for even more efficient space utilization. For home owners concerned with making their home as energy-efficient as possible, a tankless hot water heater is one of the most affordable ways to save money on monthly energy utilities. SunnySide proudly carries an extensive line of eco-friendly water heaters in many price ranges.